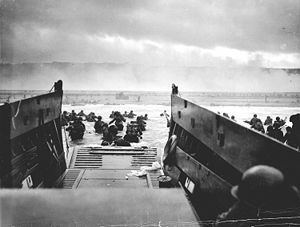 On this day in 1944, 195,700 naval and merchant navy personnel and 160,000 soldiers participated in Operation Neptune, the landing on the beaches in Normandy to begin the end of World War II in Europe. One of the most famous remembrances of that effort is Ronald Reagan’s speech to, at the time, commemorate the 40th anniversary. The Reagan Foundation has posted it in its entirety on YouTube. This is also the 70th anniversary of the Battle of Midway, which was the turning point in the War in the Pacific. To the memory of those who died in the cause of freedom. If you can read this, thank a teacher. If you can read this in English…thank a serviceman. Hello Eye! Thank you so much for remembering this special day, and our Dear Ronnie! Ah, the good old days, when we had a real man & hero in the WH. Thanks Bunni and good to see you again. I’ve been busy in Real Life with some amazing things and will blog on them if I get permission. But I’m having a week to calm down from a year of effort and should be back blogging properly by next month.